To CJ; I just turned 59, myself, and have to agree with you. The salmonella scares of the 80's made everyone stop doing this, and the e-coli scares of this century have made it impossible to get a steak anything less done than medium. So much for natural selection. @Scott Race - I always had an egg added to mine. Made it soooo much better. I just turned 65 and doing fine so apparently it couldn't have been that bad fo me. We had one in a "Class "B" mall in the late 60's-mid 70's. One of the ingredients that you could have them add was a raw egg blended in with it. I did this regularly, and while I never suffered any adverse effects, at some point the FDA made them quit because of the Salmanella dangers. The orange drinks were ok..not special and the hot dogs were. Alan Arkin was in a movie called "Simon" in the early 80's. He is brainwashed into thinking he is of alien origin. One of his comments on Earth culture is about Orange Julius..."what is that powder that makes it so devilishly delicious?" Bob - According to Wikipedia, it's "a mixture of orange juice, milk, sugar, ice and vanilla flavoring". I remember the Orange Julius corner store in Times Square, maybe at 41st and Broadway. 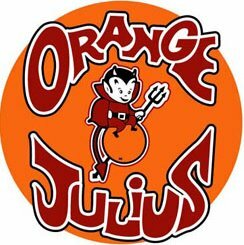 The secret to the unique flavor of Orange Julius was that proprietary white powder they scooped in along with the orange juice. Wonder what it was?? I loved Orange Julius, although I had it infrequently. First encountered it at the 1964 New York World's Fair, where it was the official drink. I gather it's still around, as part of Dairy Queen.